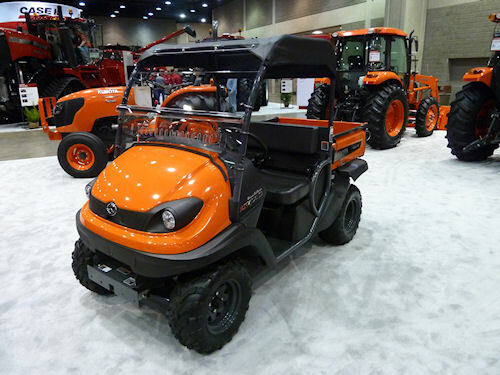 Since Kubota launched the first RTV900 utility vehicle, the company has been working on model additions. The RTV1100 came first, along with innovations like added seating. And all were diesel. Then the RTV500 came along with its gas-powered design. Enter the RTV400, a 16 hp gas-powered utility vehicle powered by a 1 cylinder Subaru engine. The key difference is the transmission. While other RTV models use a hydrostatic drive, the new RTV400 uses a continuously variable transmission, which Terry Allen, service representative Southeast region for Kubota, says is "more like a CVT-plus." RTV400 is powered with a 16 horsepower Subaru "thumper" and has a new CVT transmission that will brake on hills. In a traditional CVT when you let off the throttle the belts can go slack, the Kubota CVT keeps belts under tension. "This can help belts last longer and it allows for dynamic braking," Allen explains. "You'll have more control on steep descents and you won't always be depending on the braking system." The RTV400 chassis is the same as the RTV500, offering the chance to interchange attachments and parts. The ROPS is integrated into the design, and the CVT features a two-speed gearbox or ease of operation. Base list price for the orange model is $8,499. Add camouflage and the list price is $8999. Learn more at your local Kubota dealer, or visit www.kubota.com.